Eugene O’Neill is probably rolling in his grave with my reworking of the title of his classic play “Long Day’s Journey into Night”. The Twin Cities area shows signs of an early end to a late arriving summer. Grackle and starling flocks started forming a couple of weeks ago with mobs of hungry birds descending into yards and gardens. Some sumac bushes and maple trees have splotches of red or gold showing through the foliage. Juvenile robins display grown up feathers free of the leopard spots of their youth. Waterfowl babies are in full feathers and are the size of adults rather than waddling balls of fluff and fuzz. Hummingbirds are more frequent visitors at the feeders with an occasional quick and noisy kerfuffle breaking out. The migratory birds and butterflies are preparing for a several thousand mile trek to a place where “Snowmageddon” remains a folk tale rather than an annual six-month-long reality. July and August have been drier and cooler than normal. Air conditioning units received a badly needed break from relentless usage in June. Road repair crews find it easier to work with hot asphalt when the heat index is not five degrees above the sun’s surface temperature and the roadways are not submerged. Cooler and drier air slowed grass growth. Mowing twice a month instead of twice a week allowed people to spend more time with loved ones and enjoy a quiet evening. Cool and dry evenings were a refreshing change to the stifling heat and oppressive humidity experienced during June’s monsoon. With each passing day, morning and afternoon scurried a bit sooner from evening’s encroachment. Lower humidity and temperatures along with fewer severe storms directly result from this. Even though the weather this week has been more like mid-October rather than late August, the cicadas are still buzzing when the sun is out. At night, a few fireflies twinkle during their nightly journeys while the toads, tree frogs and crickets still have their evening talent shows without “sotto voce” subtlety. Listening to the cacophony without droning air conditioners is quite enjoyable. Perhaps the late arrival of summer along with the cooler and dryer period after June curtailed the annual Japanese beetle infestation. My rose bushes did not look like shotgun targets and there was no need to set out traps. I think I saw fewer than two dozen of the nasty little invaders this year. I will gladly take this as a win. This also ensured getting flowering red calla lilies, which the hummingbirds pay more attention to than the hummingbird feeder. As I mentioned last week, the Minnesota State Fair is still underway. The last time I attended the Fair was around 2006 with Lucy. I have a friend who is insisting on taking me to the Fair on Saturday (OK, my arm did not need much twisting). If Saturday’s almost perfect weather forecast is accurate, and if attendance is typical for the second Saturday of the Fair, between 175,000 and 240,000 people will crowd into the Fairgrounds. The Fairgrounds itself is only 320 acres in size (one-half square mile or one-half section) so navigating through a sea of humanity is challenging. Saturday’s visit will take care of my Fair adventures until the mid-2020’s and blow my allotted junk food intake until 2375. The State Fair ends on September 1, Labor Day. The United States considers Labor Day as the unofficial end to summer though the autumnal equinox does not occur until September 22. Families with cabins “up north” or “at the lake” enjoy on last long weekend and close it for the season. School is already in session in some districts with the remainder starting classes after Labor Day. The plaintive parental cry of “Go outside and play!” changes to “Do your homework!” Even humans adjust to the subtle season transition. Try to enjoy some time outdoors with loved ones. Whether your transition is summer into autumn or winter into spring, notice the changes occurring. Being part of nature helps one re-energize and reduce stress. Give your special someone a meaningful hug and thank you for your time. Orange barrel and blue language season is in full swing throughout Minnesota with some major freeway and highway reroutes testing one’s spatial orientation, IQ and patience. The same is also true for street maintenance. Any project, regardless of size, is subject to Robert Burns’ observation that the best laid plans of mice and men oft go awry. This area received nearly six months equivalent precipitation during June, most of that towards the end of the month which cause unforeseen damage and delays. One particularly curious road project is the repaving of 106th St. between Humboldt Ave. and Xerxes Ave. in Bloomington near where I live. The original project plan indicated a “mill and overlay” scheduled between July 14 and August 23 with a new striping configuration that will not work for the traffic volume and rolling hills. Mill and overlay entails grinding the existing asphalt down to a thin layer and overlaying asphalt to the required depth. One of the first tasks involved replacing natural gas line junctions which required digging deep holes in the street, replacing the parts and in some cases lengths of pipe, filling the hole and repaving over it. Two days after the natural gas company completed their project, the water department came along and did the same thing, except they sometimes broke up the new paving. Curb and gutter replacement occurred over several weeks in seemingly random thirty foot long sections. Easily 75% of the curb and gutter got replaced, and in a few instances, freshly cured concrete became freshly pulverized construction debris replaced by freshly poured concrete. Utility access entrances (“manholes” is a deprecated term) required very large and deep holes and large patches of fresh asphalt. Storm sewer drain replacement also encountered delays. Areas of the road bed were seriously damaged around some of the storm drains. Traffic volume necessitated repaving over the work areas rather than merely filling the areas in with gravel. Milling began and completed yesterday and the road is ground down to a thin layer of asphalt with deep zigzag grooves that affect steering especially in small cars. 106th Street is scheduled for closure Friday early morning until early afternoon to accommodate the overlay process, but the weather may not cooperate. Some of the weather models are suggesting 1″-3″ of precipitation starting tonight after midnight and ending Thursday after midnight along with heat index estimates of 95°-105° during the day Thursday. (Welcome to the first day of the Minnesota State Fair). Saturday and Sunday may also have heavy rain periods. The interesting part is I live on a cul-de-sac and my only way in or out is on 106th Street. I may need to park on the street one block to the west in order to get anywhere during the closure, or stay home until the street reopens. My hope is the overlay happens on schedule. Once the overlay completes and the asphalt is ready for paint there will be some very upset drivers. The street is currently configured as four lanes undivided. The new striping will allow for 5′ wide bicycle lanes, one 11′ wide lane for vehicles in each direction, and a 12′ wide center shared turn lane lovingly referred to as a suicide lane. While this configuration is successful in other areas of the city, 106th Street handles many times the daily number of vehicles and large truck traffic of those other streets. The street has several rolling hills of between 4% and 8% grade, which are very steep to most bicyclists. Those hills allow the Bloomington police department to set up very effective speed traps. Semi traffic employs a lot of “jake braking” (downshifting to use the engine and transmission to enhance braking) to keep from exceeding the posted 30 mph speed limit when going down the hills and they usually have to downshift several times to crest the hills. As for bicyclists, not all of us are Category 1 bicycle racers logging 30,000+ training miles per year or have Tour de France experience. The dearth of traffic controls between Xerxes Ave. and I-35W make 106th St. a preferred shortcut for harried commuters anxious to get home which increases the likelihood of speeding. Another tentative project threatens to funnel even more traffic on to 106th St. rather than off it, and that connector project has a few hundred households petitioning to scrap the connector. Such is the price one pays for progress, just as long as it affects some other neighborhood, of course. My concern is the bicycle lanes and the suicide lane become axillary traffic lanes during rush hour periods even without the tentative connector. Add in mobile phone calls, or the illegal in Minnesota texting while driving, and the accident rate will increase while the traffic speed will not decrease. I welcome bike lanes, but I also welcome common sense and determining if a project is practical before its undertaking. In all seriousness, the repaving is long overdue and repairing road bed damage from the June deluges is a bonus. Perhaps next year, the plan for 106th St. is for a quick overlay and re-striping back to four lanes. Very highly educated people with advanced degrees in traffic engineering spent time developing the project plan, so the street lane reorientation success is likely a foregone conclusion. If you believe that, I have some ocean front property in Iowa for sale. This post was definitely a departure from my normal fare, and I thank you for your time and patience. When life seems like curiously planned road construction, remember to take a breath and know that this too shall pass. What may be a challenge today may be an improvement tomorrow. If you have a special someone, you will find the confusion and frustration are more manageable. Give that person a meaningful hug or two for being there for you and with you. It may help you see the orange barrels without using blue language. 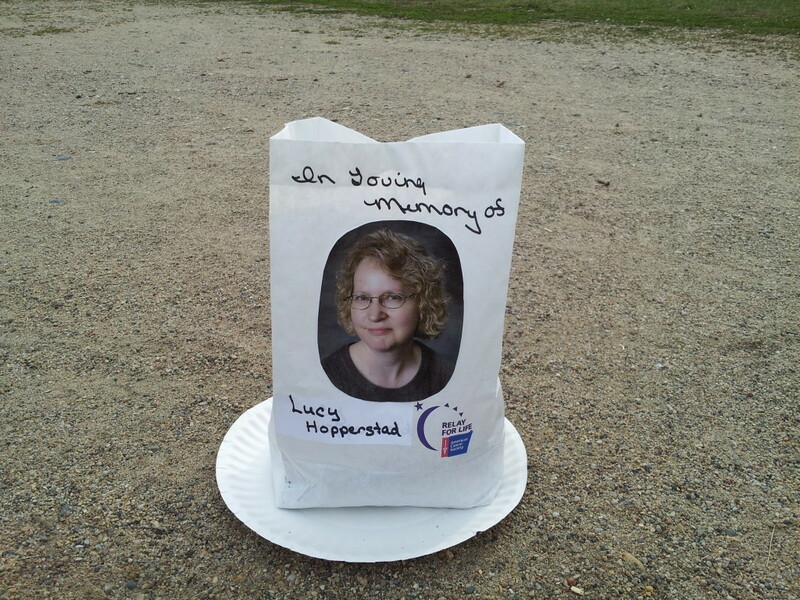 Last Saturday was the Freeborn County Relay for Life held at the Freeborn County Fairgrounds in Albert Lea, MN. It was a successful event with 32 teams participating and raising $72,684.47 as of this writing. Part of the fundraising is through sales of luminarias that people personalize and set out for the lighting ceremony. A luminaria is a white paper sack about the size of a lunch bag. It is partially filled with sand for weight and slight fire proofing. Each luminaria contains a votive candle that is lit during the lightning ceremony. A high school classmate of mine made a beautiful luminaria in Lucy’s memory along with more than a dozen others honoring or memorializing other cancer warriors. Freeborn County, Minnesota is not heavily populated. The 2010 Federal Census lists 31,255 county residents with 18,016 of the people living in Albert Lea. No other community in the county has 1,000 residents, and there are several communities that have populations under 100 or remain unincorporated. 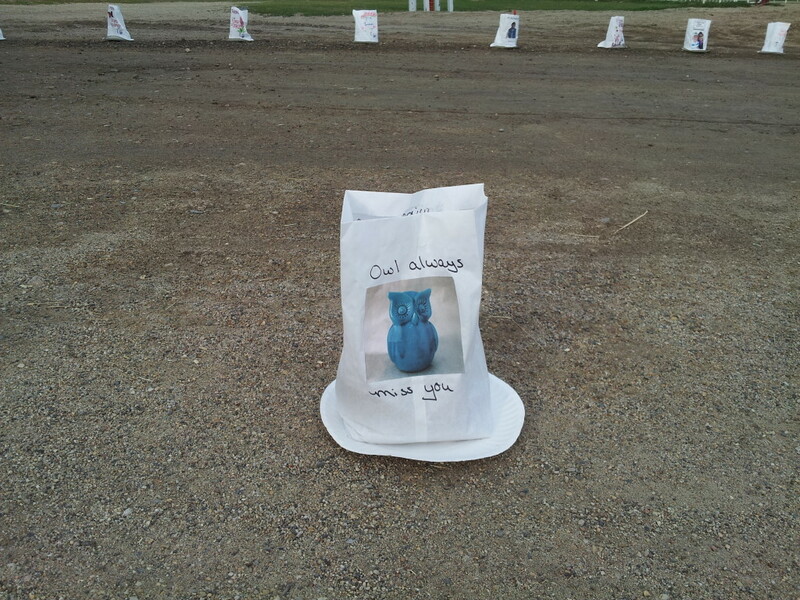 I have been unable to find out how many luminarias there were along the both sides of the half-mile Relay for Life route. There were several other areas off the route held a couple of hundred more luminarias. My guess is the participants created between 2,500 and 3,000 luminarias, and that guess is probably low. It is during the lighting ceremony that one sees the full enormity of cancer. A tiny light here, another point of light there quickly became parallel ribbons of light. Each of the luminarias honored a survivor still battling cancer or memorialized a loved one whose battle ended. Each luminaria represented the love and support of the family and friends of those cancer warriors, the thousands of lives affected by cancer, and the hope that darkness of cancer is eradicated someday. Thank you, Nadine, for remembering Lucy. It was an honor to participate with you and to honor your successful battle. Please keep me in mind for next year’s Relay for Life. Thank you to the Cummins Filtration “Filter Out Cancer” team for your hospitality and support. I have posted more pictures of the Relay for Life in my photo gallery. If anyone has pictures to share, please contact me using the contact form at the end of this post. I will happily credit the photographer. Many of you have a loved one battling cancer or are battling cancer yourself. Draw on the love and support of your family and friends. 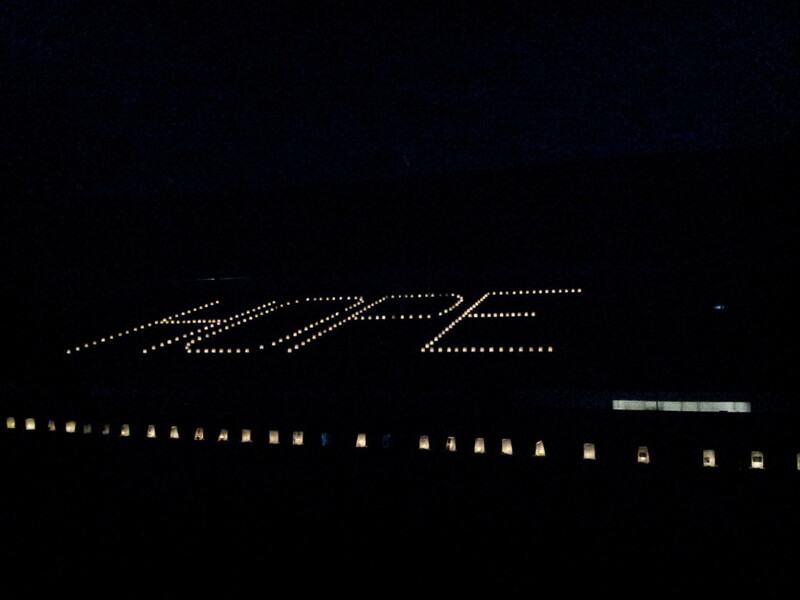 Like the luminarias lit at the Relay of Life, each person on your support team is a light in the darkness. When it seems like darkness prevails, remember that candles at night shine oh so bright. Buried in berries? It’s a good thing. June’s record-setting rainfall did not do much good for many of the garden plants. The roses have brown spots on the leaves from fungus, the prickly pear cacti rotted in place, the hardy hibiscus proved it was not and the apple trees lost most of their blossoms and some of their leaves during a rainfall that came down hard enough it sounded like hail hitting the roof. Once the rain tapered back to normal amounts and the temperature warmed up, the raspberries kicked into high gear. Now that August is here, the berry harvest is ending soon, probably by early next week. Thus far, there are ten pints picked, easily three pints lost due to drop offs, raccoons and birds, and probably two more pints ripening on the canes. It has been a very good year for raspberries and the lack of Japanese beetles helped quite a bit, too. The blackberries were disappointing with less than a handful for the total harvest while last year’s harvest was almost two pints. I managed to give a friend a pint of raspberries and received a pint of homemade tapioca pudding in return. That was a great trade, so I am trying it again! Lucy and I enjoyed raspberries, even though I did most of the picking. I rarely suffered mosquito bites and barely reacted to them. Once I lost weight, I became attractive to mosquitoes, which are the only females that find me attractive. Lucy would have a quarter-sized welt from a single mosquito bite. The raspberry patch is next to the air conditioner, so I would put a large fan on top of the air conditioner when we were picking berries to keep the mosquitoes mostly at bay. The fan also helped on the oppressively humid days the Twin Cities sometimes gets in the summer. Fortunately, the mosquito population dramatically thinned out when the water in standing pools and puddles dried up. I can pick a pint or two of berries without needing a transfusion afterwards. It has been less humid, a bit cooler than normal, and there has usually been a breeze when I have picked this season. Gardening teaches us that there are still many things outside of our control. The weather doesn’t cooperate, an insect or bird infestation wipes out a crop, winter kill decimating supposedly hardy plants, growing conditions are unfavorable and so on. Patience and perseverance are part of a gardener’s mantra along with some (OK, many) words unfit for a family friendly publication. A bumper crop of raspberries makes up for a shortfall of apples. The spot occupied by a dead clematis becomes the new home for a yucca. Tree branches removed either by the wind or by a chain saw become wood chips for composting and mulching. Acceptance of things beyond one’s control helps with coping and rebuilding. The end of berry season is also brings an awareness that the days are noticeably shorter as summer slowly glides into autumn. Cicada, cricket, toad and tree frog sounds mix in with the bird songs. Juvenile birds feed alongside their parents. Monarch, sulphur, cabbage white, zebra swallowtail and mourning cloak butterflies float from flower to flower looking for a meal. Twinkling fireflies are always a bonus when watching this part of the world wind down for the evening. Fewer mosquitoes and other flying pests means a more enjoyable time around a bonfire or sitting out on a deck with friends. Being in touch with nature helps with stress reduction, even if the garden is just a couple of potted plants on an apartment balcony. Take a few minutes to get in touch with nature, preferably with your special someone (chasing a lawn mower does not count). Enjoy the sights, sounds and smells, especially if you are not on a path frequented by geese. Treat yourself to a handful of freshly picked berries if they are available and your diet allows them. Most importantly, give your special someone a meaningful hug and enjoy that closeness. A hug is the best stress reliever of all.